Hush, directed by Mike Flanagan (Oculus), presents to us an evocative and sincere take on the horror genre, thematically recalling the innovative and winning Korean movie Blind. Once more, we experience a slasher film in which the abilities of our protagonist shapes their survival story and how we, the audience, experience the movie. This is an incredible rush of pure cinema, a movie of sense and sensations. The opening scene alerts us watching at home to how much we hear and how much we take sound for granted - as our hero prepares food, the cracking of egg-shells and the crisp staccato cut of a knife hitting a wooden chopping board reverberate with colourful clarity. The hiss of boiling water and the sizzle of dripping fat fill our ears. 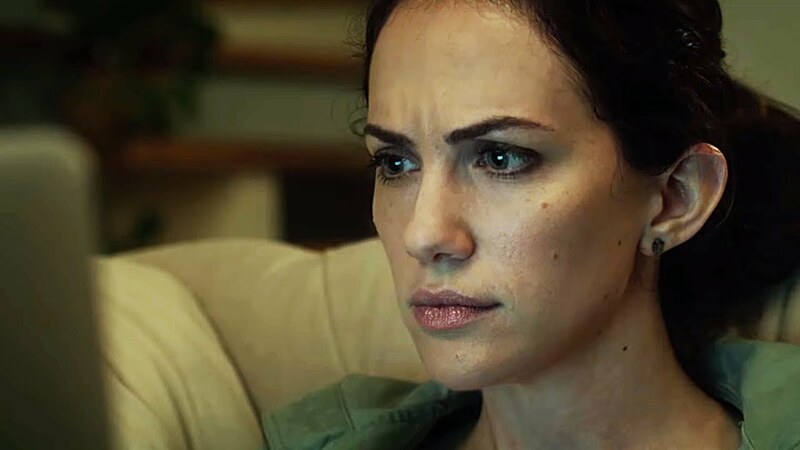 From here, we meet our protagonist Maddie (co-writer Kate Siegel) - the camera shows us her face before returning our gaze to the slow-cooking lamb. The difference now, however, is that the sound design has muddied and faded, removing the cackle of cooking meat we had previously noted. We are now in Maddie's world, removed of one of our primary senses. As she drives her knife repeatedly down onto the chopping board, and she stirs her sizzling concoctions, we hear nothing but the dull thud of silence. This will not be the last time in the movie that the sound of a knife dicing up a target will go unheard. Remarkably, in less than two dialogue-free minutes, Flanagan has made us hyper aware of how we comprehend our own existence whilst simultaneously introducing us to, and helping us relate and empathise with, the day-to-day experiences of others. This is a deftly powerful, gently moving opening and one which helps place us in the remote cabin in the woods Maddie inhabits in solitude. For anyone au fait with horror movies, however, we know her lonesomeness won't last for long - we're soon introduced to a masked menace who invokes in us memories of the original Scream. That his motives seem to extend no further than gleeful masochism makes him all the more terrifying. At just 87 minutes, Hush is a rather short movie but one which packs in unrelenting dread and terror throughout almost the entirety of its running time. As Maddie hides in and scurries around the dark corners in the claustrophobic confines of her home, we're left on the edge of our seat as we cheer on her survival. It is a gruesome and brutal movie, punctuated by explosions of gory violence, but one full of great beauty too. Anyone who has ever watched someone communicate with sign language will testify to its aesthetic splendour whilst one set piece at the film's culmination features the most visually impressive, and potentially iconic, use of strobe on film since David Lynch's heyday. The scariest, most spine tingling home invasion movie in years. Just don't, whatever you do, watch this alone.